So the two arrived on Tuesday at 8 a.m. to the Best Buy on North 10th Street. No one else was there, and the store wouldn’t open for Black Friday until 5 p.m. on Thursday. So it goes for eager deal seekers this time of year. Discounts bring crowds to Best Buy, La Plaza Mall, the Rio Grande Valley Premium Outlets in Mercedes and many other stores across the region, and the country. A line formed an L shape around the north McAllen Best Buy, as a hazy sprinkle fell on a cool Thanksgiving afternoon. Texas, Tamaulipas and Nuevo Leon license plates dotted the parking lot. Some shoppers unfolded umbrellas, others wore hats. One person bought a broom to disperse the water so it wouldn’t pool under the feet of those in line. Some of the deals the electronics store had on tap for the holiday included noise-cancelling headphones, tablets, speakers, kitchen appliances and laptops. Sael Elizondo got in line around noon on Thursday for a new Macbook. His previous one was damaged, and he plans to graduate from the University of Texas Rio Grande Valley in the Spring. So he wanted to get a new Macbook that was $200 cheaper for Black Friday. Michael Gonzalez, another person in line, is a student at South Texas College and he’s interested in saving money. Gonzalez wanted to purchase Microsoft Office, even though the deal wasn’t significant. “Every penny counts,” he said. 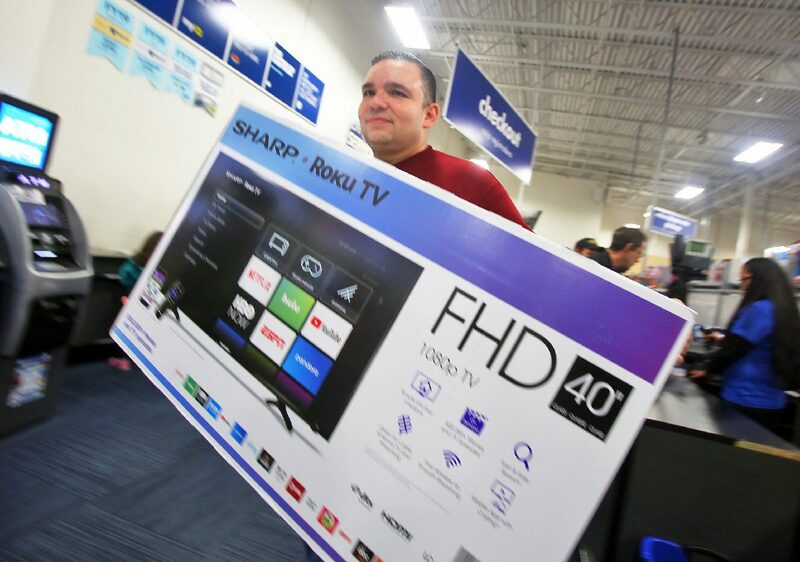 Blanca Elizondo arrived around noon as well, and she wanted a new 65-inch Samsung TV for her family. But the day had worn on her. “I’m already tired,” she said. The noon arrivals said there were about 20 people in line when they found their place in line. “The first people had a tent,” Sael Elizondo said. Upon learning the first group arrived on Tuesday, Blanca Elizondo appeared to get more exhausted at the thought. “That’s too much,” she said. The doors were going to open shortly, and Best Buy employees were offering signups for company credit cards. Some of those same employees were about to direct the shoppers where to go in the store for their specific needs. Paez’s eyes were red. It wasn’t from camping since Tuesday, but from the taxing work in the oil fields. He was ready to finally have his hands on the new Playstation and the television.